See the link above...this is our form. I have a coupon code set for each of the 4 event (in order, they are BRAIN, VOCAB, MATH, and TECH). I emailed the link to myself and tried a dummy registration. I enter the coupon code in the bottom and push "apply." When I submit the form, it correctly goes to PayPal, but the discout is not applied to the price. I'm not so sure that I understand the point of your Coupon. It should show the discount even before you make the purchase so that it becomes known and carries over into the Payment Gateway. However, with your's it stays the exact same price. I think I found why this problem is happening. It appears on my end that you haven't applied this to any of your products to match so because of this the discount isn't reflecting it. Thanks. The discount coupon is for early registration. I was going to manually deactivate it on April 1st, when the early bird discount expires. 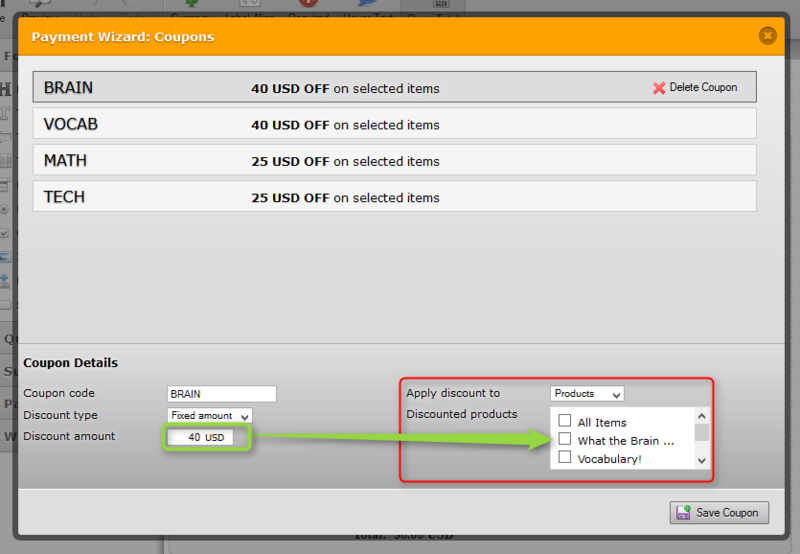 But I will double check the discounted item match, I do remember checking each box individually for each coupon.